“I know that some of you out there are creationists. You really don’t believe in evolution. Some atheists go into denial when I mention that there are college professors that are openly derisive of the beliefs of their students, and actively work to destroy Christian beliefs, and others justify the practice since it fits their own bigotry. It should not be surprising to have this happen in America. After all, we have unrepentant terrorists like William Ayers getting tenure. Active discrimination against creationists exists. True scientific inquiry does not protect the established orthodoxy, but will examine scientific evidence that runs against it. The same goes for education. 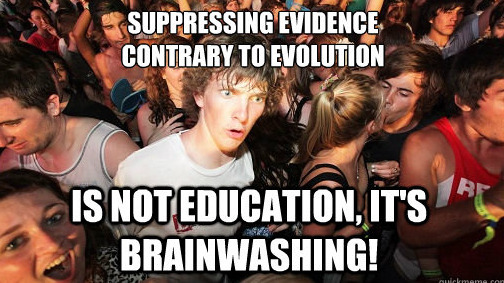 Let's face it, we do not have education, we have indoctrination centers. And anyone would be hard-pressed to find a legitimate educational reason for attacking the personal beliefs of students. A university dean in Florida, who moonlights as an Episcopal priest and is an admitted lesbian, recently caused controversy after a video surfaced on the web that provided snippets of a lecture she delivered to students in her Epistemology class, in which she discusses religion and evolution. You can read more about this Stalinette in "University Dean Tells Class: ‘Bible is Myth,’ Creationists Shouldn’t Graduate". 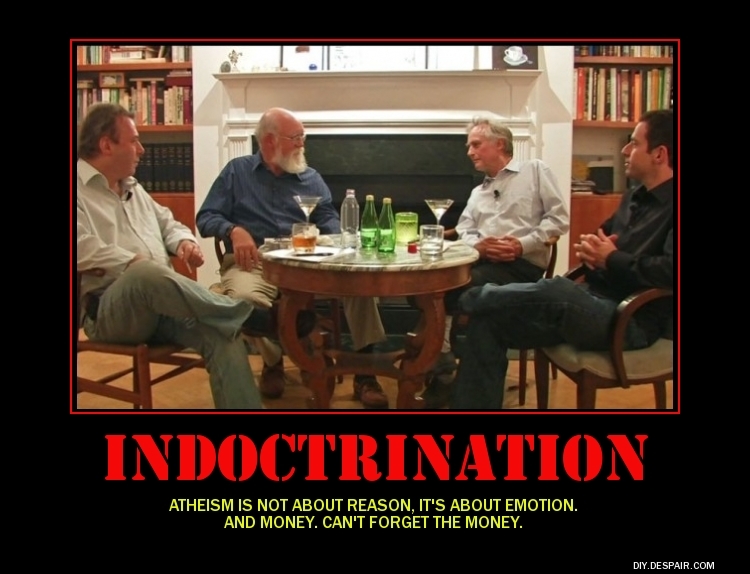 How can people who claim to love "reason" bow down and worship the atheist popes? 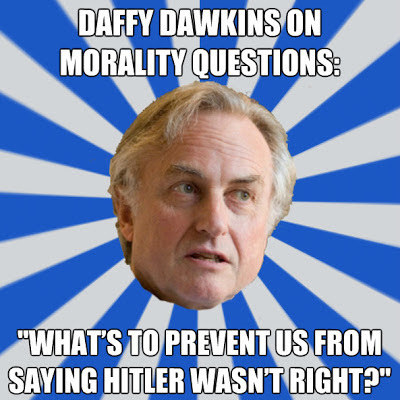 Especially Richard Dawkins. His emotive rantings are inconsistent and illogical, and his "morality" is sadly lacking. Most people who want to get along with others will not get in their faces and ridicule their beliefs, but that is what Daffy Dawkins advises. When inquiring about how much money Dawkins is worth (about an 'undred million quid according to the 2012 "Rich List" of the Sunday Times), people get defensive and ask, "Why do you want to know? ", or say, "It's none of your business". Yes, misotheists flat-out lie about the amount of money that creationists and ID proponents have, but it's perfectly acceptable to get rich from hatred and religious bigotry. Double Standard, thy name is "atheist". Dawkins lied about a debate that he lost, claiming that it never took place. Now he is ready — to dodge debates. Probably because he knows that creationists tend to win the debates. He is not consistent with his own religion of atheistic evolutionism. Sometimes he says that life could not have evolved because it's too complicated so it life on Earth had to have been seeded by space aliens. Then, he goes back to defending evolutionism. Which is it? This atheopath is living in a manner consistent with a true evolutionist: Do whatever brings you the most happiness. This includes cowardice, dishonesty, strife and confusion to bring in money and respect of non-thinking worshipers. One of these baffling sycophants is Michael Nugent, who seems oblivious of his hero's many moral failings. He actually calls Dawkins a "caring, sensitive man". Well, maybe he is when it comes to his friends. Take a look here and read "Irish atheist Michael Nugent called Richard Dawkins a 'caring, sensitive man'", plus information on the global decline of atheism and the rise of Christianity. 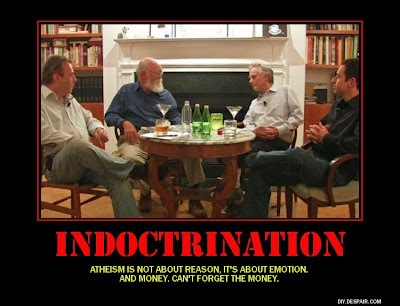 With "thinkers" who adore Dawkins, no wonder atheism is on the slide. This kind of evil never sleeps. But then, maybe some people are catching on, as Dawkins is losing Web traffic.